How Do I Shop Securely at Your Online Store? I'm Not Sure If You've Received My Order? You need to register to see all the prices because this is a Trade only gift store. It only takes a minute and you can register here now. As a business you'll be entitled to bulk discounts and be able top view all of the Jaycia product range. Jaycia only supply to Trade customers so use our fast registration now to see the huge range of gifts we have waiting for you. We don't sell to the general public and do not display all of products to unregistered visitors. All sensitive data is processed via our SSL website connection. All this means is that when you want to send us payment details (like credit card numbers), the information you send to our website will be encrypted and secure. Jaycia only supply to the Trade and specialise in the Wholseale supply of candles, essential oils, fragrance oils, jewellery and many other low priced Home fragrance gifts. All UK orders with goods totalling £200+ VAT or more are Free of charge. We currently have a maximum charge of £7.50+ VAT for all orders below £200+ VAT that are to be delivered to a UK address. All charges are subject to change. All standard delivery to UK mainland is by UKMail parcel delivery but we may use other reliable companies from time to time to deliver your goods. We have many customers around the world and we will calculate the charges for you after you have placed the order. Charges depend on the size, weight and number of cartons of your order. We will notify you of the delivery charges to non UK countries after you have placed the order and will not dispatch it until you have agreed this amount. Wondering when your order will arrive? Need to change something about an order you've placed? You can review and revise your order so that it's just the way you want it by visiting Your Account. You need to log in to see Your Account details in the top menu next to Your Basket. For security reasons, we can only modify orders or send account information when the request comes from the e-mail address that is associated with your Jaycia account. We can only read and respond to messages in English. If you have used our forms to contact us in the past but have not received a reply, your ISP or e-mail client may be blocking e-mail from jaycia.co.uk. If you suspect this is happening, please consult the help section of your e-mail program to see how to relax or remove the settings that filter or block mail. Once you've established that you should be able to receive mail from us, please contact us again with your question. Want to check if your ISP or e-mail client is blocking mail from jaycia.co.uk? Try subscribing for a Special Occasion Reminder. If you don't receive it on the date you specify, you will know that messages from jaycia.co.uk are being blocked or deleted automatically. Please double-check your credit card and/or with your bank to ensure that none of these problems have occurred. If you realize that you've made a mistake, simply return to the payment option page and enter in the correct information. Continue checking out as normal. If you're still encountering problems, please contact us. However, at NO point should you ever e-mail us your full credit card number. Your e-mail does not have the same security features in place as the website. If you wish to reference a specific credit card that you already have on file with us, please reference by the order number. If you believe that you have provided us with an incorrect CVV code or expiration date you may send us that corrected information via e-mail referencing by the order number. If you believe that your card was declined due to insufficient funds, but now have those funds available, you may ask that we attempt to charge your credit card again. If you believe that your card is restricted to point-of-sale transactions, you must either contact your bank about removing such restrictions, provide us with a different credit card, or choose a new payment method. There are a number of reasons why it may appear that we have not received your order, particularly if a confirmation page cannot be displayed (or an error is reported by the system) in the final stages of checking out your shopping basket. Occasionally connections get interupted on the Internet or you may not have cookies enabled for your browser. 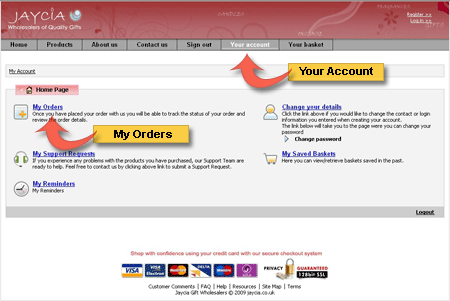 Follow the guide below to see whether the order has been recorded (registered users). Firstly, if you've placed an order and received an error you should still be logged in to the system. Your basket will only be emptied if you specifically log out, close your browser window or don't engage in any activity on the website for 20 minutes or more. You should still be able to see prices etc. If you can't get to another page on the website through an error, open another browser window or tab (don't close the current one) and log in again if necessary. 4. Do you see any orders? If the system has recorded your order and basket items it will be logged here and we will have received it without any problems. If you're in any doubt send us a support message through the 'My Support Requests' section... or give us a call in office hours if you wish. We want to be flexible for you, and we think that on your first order a £100 + VAT minimum is fair. After your initial order - there's no miinmum, just order what you need.